ICFG supports a lot of different mission opportunities. Check out the Apostolic Christian Church Mission Board website to see all of the missions the ACC is involved with. We must not only be taking the gospel out to the lost, but we must be bringing the lost into our homes and showing them what it means to live out the good news of Jesus Christ. The Japanese Homestay program is intended to do just that. 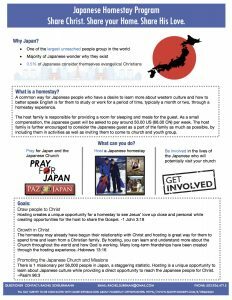 There are many people from Japan who are interested in a cross-cultural and English-language learning experience within North America, and by matching them with a Christian family/home, we hope to open up the opportunity for these Japanese homestay participants – most of whom have never heard the gospel – to see what it looks like to follow Jesus Christ on a day-to-day basis. Project Nehemiah is our domestic missions program. There are currently no active projects, but if you’d like to start one, let us know how we can help you! Just contact us and we’ll talk.